Have you heard of Maptia yet? Not only do I wholeheartedly agree with their manifesto - but I'm loving the fantastic interviews going up on their blog. 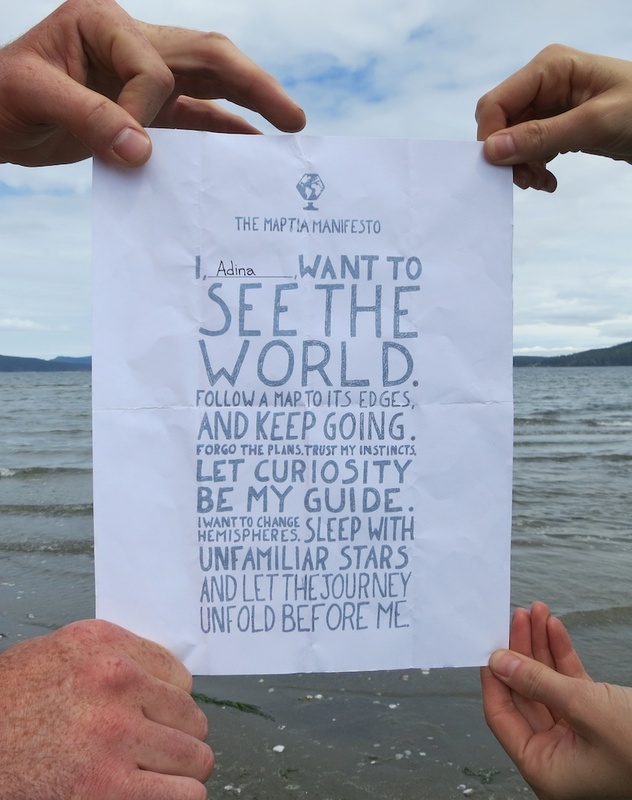 As part of their project to spread their manifesto around the world, we took a photo of it while we were camping on Lopez Island this past month. I'm working on creating my first trip video with footage from Lopez Island, WA - so I've been watching lots of others for inspiration. Some of my favorites found via Afar; a couple's journey in South America, surfing in Bali, and a trip around the world in 60 seconds. And via Adventure Journal; climbing in Greenland. My roommate from Camp Mighty has been reflecting on her 21 days in Vietnam. Lessons Learned from 11 Years of Travel. Marin County is one part of California I just can't get over - so I love this tour of Mill Valley. Did I ever tell you how I left Christchurch just hours before that major earthquake? Dave wrote a wonderful piece about returning to his hometown after the quake. Annie wrote a wonderful piece about the Fort Greene neighborhood of Brooklyn. Fantastic round up of all things gluten free bread baking. I'm becoming incredibly enamoured with traveling through Canada. Can't wait to see Girl Rising. Hidden caves in Barcelona? Well I guess I'll just have to go back! I'm not so into yoga, despite my best wishes, but anything to make my body happier on long flights! A gluten free (except for the beer) cider bar has opened in Seattle! I shared recipes for Rhubarb Tea Bread, Split Pea Soup, Rhubarb Scones, & Rhubarb Curd. I wrote about walking through Northwest Seattle, hiking to Lake Serene, and eating gluten free in and around Dijon, France.